I first published in 2010 on the leaf spritz technique for "selective" control of invasive plants without affect on nearby "good" plants. The spray solution is a 15-20% solution of Garlon 4 in bark oil. Invasive sunflower that was leaf-spritzed two weeks earlier. I returned next year and found only three or four stems that had survived (or had been missed). Since then I (and others) have used this technique for a wide variety of herbaceous plants. Many modifications can be done, depending on the species and the extent of the infestation. A later post provided more detail. The original technique was to use a spray bottle to "treat" a few leaves in the upper part of the plant. However, some folks prefer to use a sponge to treat the leaves, and this technique also works. The advantage is that there is less chance of herbicide dripping onto "good" plants. This post shows how this modification works. The roots were also killed. A major advantage of the "spritz" technique is that this is a "low-volume" treatment. Because the herbicide concentration is high, one doesn't need to "soak" the whole plant, as agriculturalists do. The fact that the herbicide is oil-based may have some significance here. (The original reason I was using this mixture was because I was doing basal bark treatment of woody plants, so I had the spray bottle in my hand. Why not try a few nearby herbaceous plants? Also, the leaf spritz technique does work for woody plants, as the buckthorn photo shows here. Among other species that the leaf spritz works on are burdock, mullein, bird's foot trefoil, alfalfa, sunflower, and sweet clover (basal stem treatment). I especially like this for dealing with large multi-stem patches of sweet clover that are too thick to dig quickly. I pull the stems back toward me, then lean down and spray the stem bases on the far side of the patch. Within three days they show distress and within six days they are dead! Ancient (hidden) bur oaks (Quercus macrocarpa): Can they still be saved? 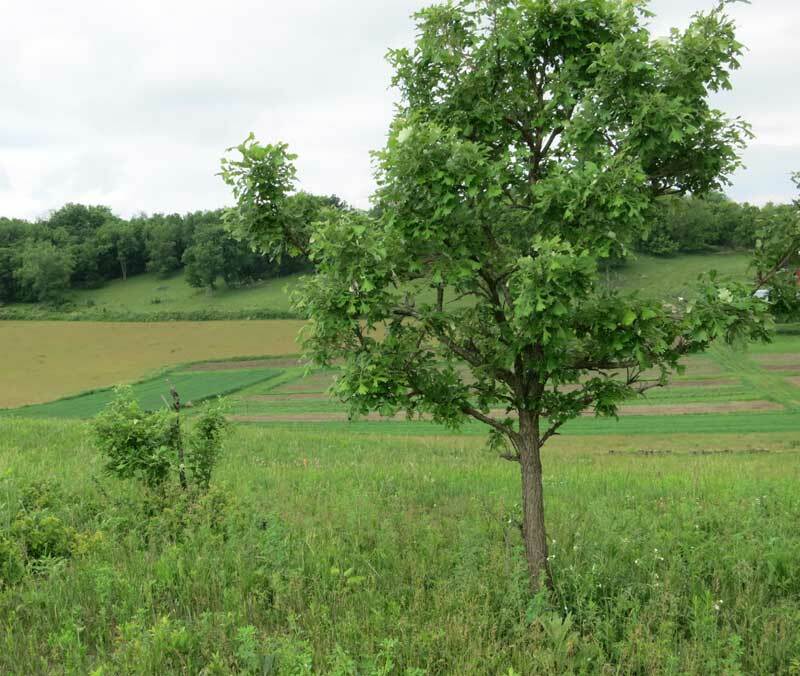 According to numerous reports (reviewed in this publication), bur oak (Quercus macrocarpa) populations have decreased dramatically since European settlement, and conservation and restoration of this species has become a management priority in many areas. According to the U.S. Forest Service, in the early 1900s, bur oak savannas occupied 32,000,000 acres (13 million hectares) in the Midwest U.S., of which only about 6,400 acres (2,600 ha) remain. Loss is due primarily due to agricultural development, but fire exclusion is another important factor. The seriousness of the loss of this important species has motivated some parks and natural areas to carry out programs with school children and others to collect acorns and raise oaks for planting. This is a meritorious endeavor although not likely to produce ancient oaks in the foreseeable future. However, it seems to me that there is another approach that holds promise. There are extensive areas in the Midwest where venerable bur oaks already exist. Observations of wooded hillsides in some areas often reveal the presence of large bur oaks that are hidden among extensive invasive brush and trees. These trees, often called “wolf trees”, can often be seen through the dense shrubbery, especially in the winter when leaves are absent and snow provides a contrasting background. Although these open-grown bur oaks are probably in weakened condition due to shading, it is possible that many might still be saved. Pleasant Valley Conservancy (PVC) can provide an object lesson of what can be done. 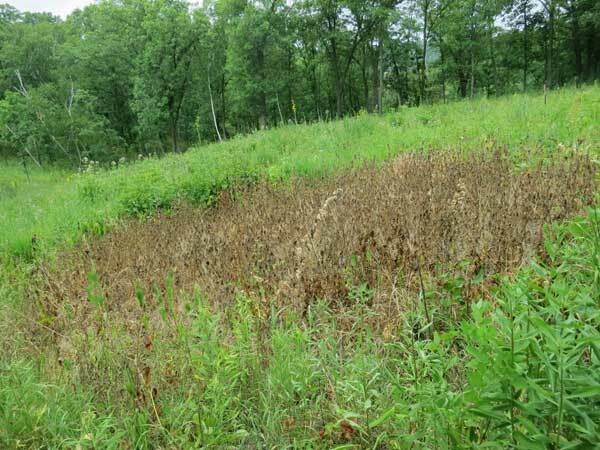 When restoration began at PVC about 20 years ago, we knew that hidden among all the invasive brush and trees were many large bur oaks, especially on the upper slopes and ridge tops. Many of these were large open-grown trees and subsequent age determination showed that many were over 200 years old. In the 1937 air photo shown here most of the large scattered trees are bur oaks (see later photo below). As the years went by in the absence of fire, this landscape filled in with invasive trees and brush, as the air photo from 1990 shows. However, the large bur oaks are still present, but hidden from view. 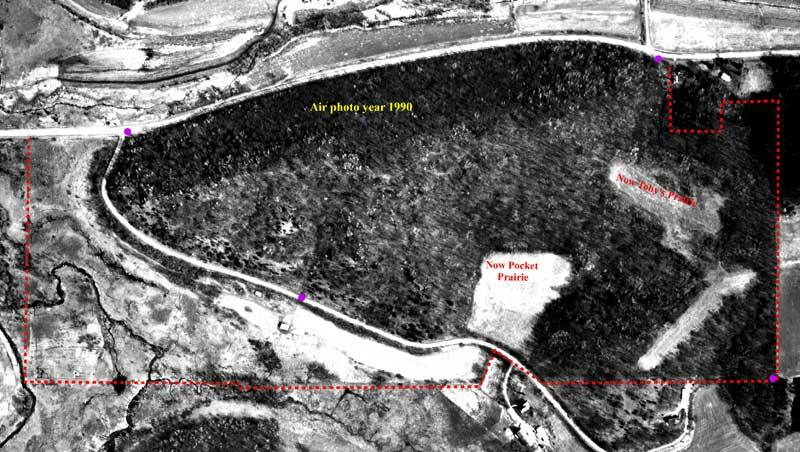 Air photo from 1990 showing the same area, before restoration work had begun. After some years of restoration work, the habitat was opened up, permitting the existing bur oaks to flourish. 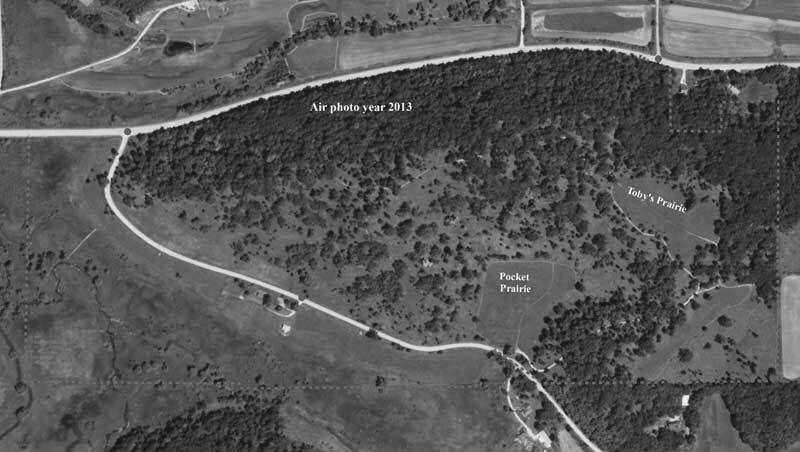 The 2013 air photo shows the result. Air photo from 2013, after restoration was complete. When restoration work began, the goal was to remove all woody plants, both shrubs and trees, that were crowding open-grown oaks. Many of the open-grown oaks, especially on the ridge top and south-facing slope, were either bur or white oaks. Over a six-year period, about 60 acres of woody areas were restored. All invasive woody plants and trees were removed. Trees removed included all fire-sensitive species such as black walnut, slippery elm, black cherry, aspen, box elder, red maple, and basswood. Even red, black, and Hill’s oaks were removed if they were crowding open-grown bur or white oaks. Once the restoration work was completed, a census of all trees over 10” in diameter was made. Those trees greater than 20 inches in diameter would be trees that were present at the time of the 1937 air photo. There were 251 bur oaks and 111 white oaks that were greater than 20 inches in diameter. The table below provides the bur oak data. 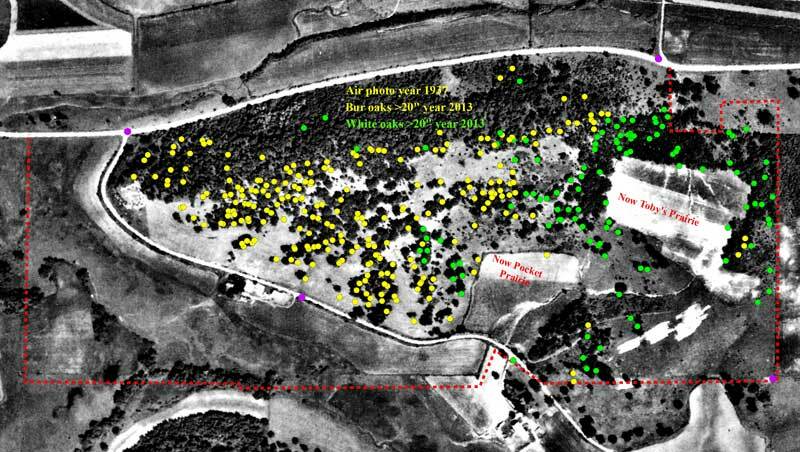 Using GIS, a map was prepared that overlays the >20 inch oaks onto a georeferenced version of the 1937 air photo. Note that the large bur oaks overlay quite well the 1937 trees (within the accuracy of the GPS device used). It is evident that most of the large oaks are superimposed on top of the black tree patches in the 1937 air photo. It can thus be concluded that most of the large oaks that were present in 1937 are still present today. The ages of some of these venerable oaks were determined by the U.W. Platteville TREES laboratory by dendrochronology. The oldest living tree has a start date of 1736 (280 years old in 2016). It is likely that PVC is not an isolated example, and that there are numerous other sites in in the Midwest where ancient bur oaks still survive. They may be heavily overgrown and struggling, but the bur oak is a remarkably resilient tree, and with care may still be saved. Using automobile surveys, venerable bur oaks may well be located today by casual observation in heavily wooded areas. Once such areas are found, the historic air photo of that area can be used to confirm the site, and then a detailed “on-the-ground” visit made. It is recommended that using historic air photos (in the public domain and available on-line in Wisconsin or from the U.S. National Archives), potential areas for bur oak restoration should be located and visited today. 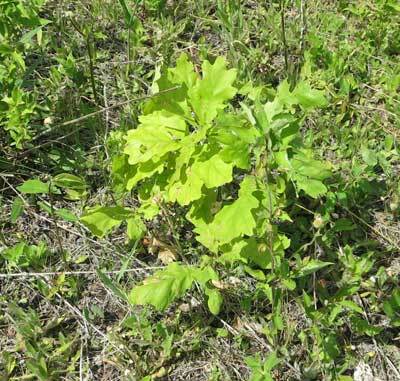 Look for the presence of open-grown oaks on south-facing slopes, most of which will probably be bur oaks. Visit the same locations now. Because an identified area now is most likely unlogged and hence thickly wooded, the open-grown oaks may still be visible within the thicket. The best time to do an on-the-ground survey is in the winter with snow on the ground. Note that recent air photos will not reveal the presence of these ancient bur oaks (unless the area has been restored) because of the heavy tree growth. One must use the oldest available air photos. Fortunately, the air photos taken in 1937-1941 by the Soil Conservation Service are now available free of charge (in Wisconsin from the State Cartographer’s Office. Access the Wisconsin Historic Aerial ImageryFinder. There are quite a few small bur oaks at Rettenmund Prairie that have survived various fires over the past 15 or so years. I don’t know where they came from but they are thriving, and some day will cast enough shade to convert their immediate domain into an open savanna. Saturday after the work party I took some photos of these small trees. 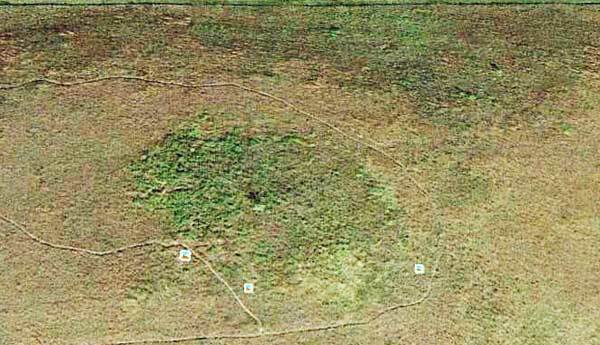 They are found in two places: 1) At the top of the North Unit and on the hill facing north to Fesenfeld Road; and 2) on the middle of the Saddle. The photo from Google Earth shows the North Unit. Most of the green in this 2013 photo (cropped) shown here is not bur oaks, but prairie willow and hazel, but several small green “dots” are definitely bur oaks (see the photos of the larger bur oaks farther below). Georeferenced image cropped from Oct 2013 Google Earth. This is the top of the knoll on the N unit (the footpath shows clearly). 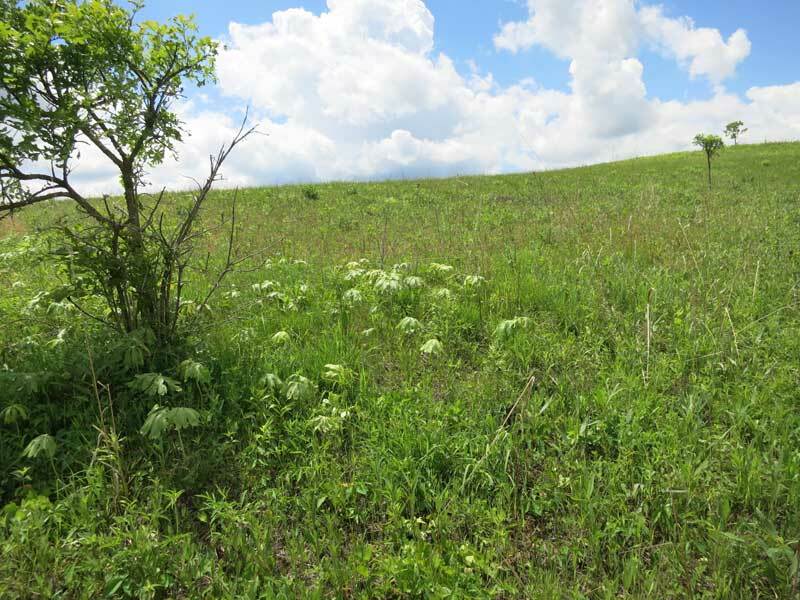 The largest bur is at the top of the hill mixed in with the prairie willow (see photo with Kathie below), and the three green “dots” in the upper right hand corner are burs on the hillside (see photo below). There is a clone of may apple surrounding one of the bur oaks on the side of the hill (see photo below), which represents a “legacy” from when this area was heavily wooded. 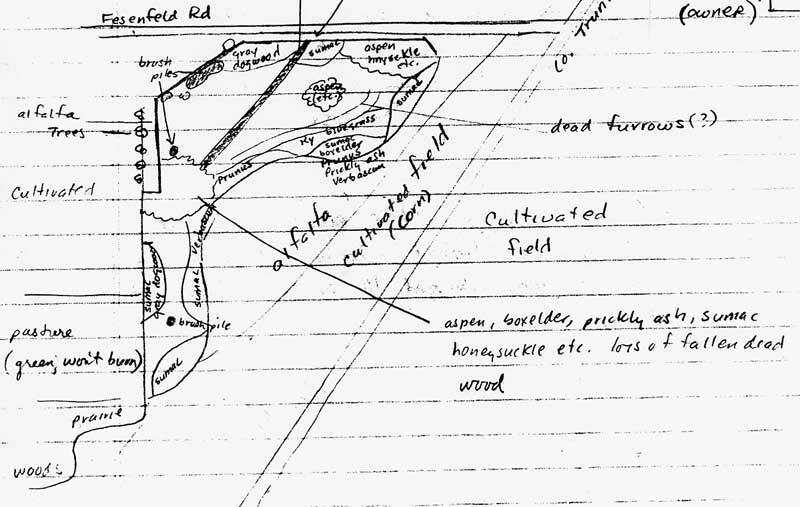 (See the Converse map from April 1984 below). Although may apples can hang around a long time in sunny habitats, they need fairly substantial shade to get started. Map drawn for the Nature Conservancy by C.K. Converse in April 1984, before any restoration work had been done at Rettenmund Prairie. Note the woody patch (aspen etc.) on the top of the hill in the North Unit and the large woody patch in the Saddle (labeled by the long leader). Both of these areas have bur oaks today. showing the large woody vegetation in the area where small bur oaks live today. and have been removed as part of the prairie restoration process. 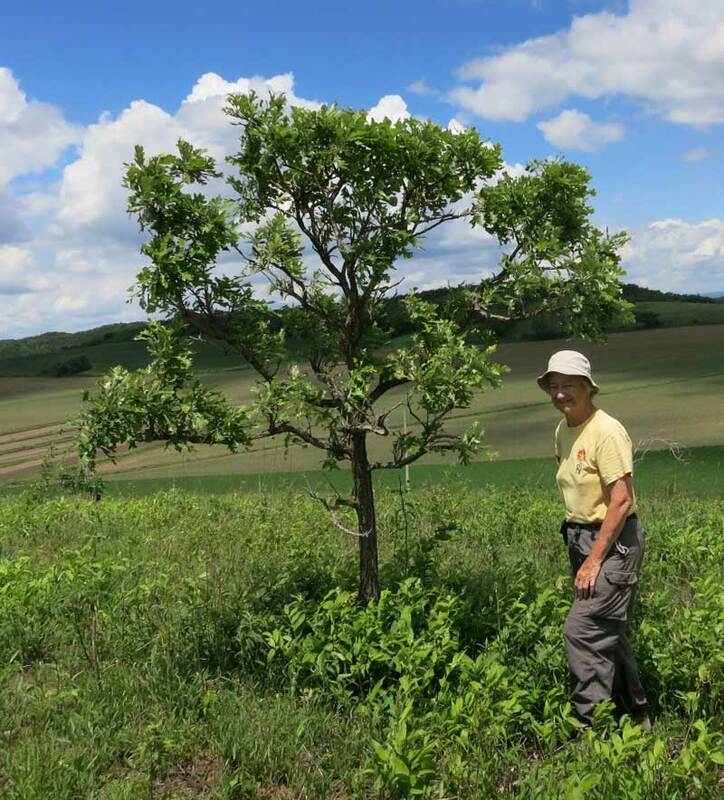 Head-high bur oak on the lower slope of the N unit, surrounded by a clone of may apple. Note also the two other bur oaks farther up the slope. Small bur oak “grub” on the North Unit. Presumably arisen from an acorn sometime in the past few years. There are no acorn-bearing trees anywhere near Rettenmund Prairie or anywhere within a mile. Two bur oaks on the Saddle, in an area that once had a large woody patch. The large specimen is about 15 feet tall. The small one consists only of resprouts. The flame height of this year’s fire was probably less than 4 feet high, so that the tall tree, with its corky fire-resistant bark, was unaffected. The largest bur oak on the top of the knoll in the North Unit. invaded by woody vegetation, including prairie willow, hazel, and gray dogwood. Bur oaks and fire: Both units where the bur oaks are present were burned this spring and are burned two out of every three years. Because the grass fuel at Rettenmund is fairly low, flame heights are not very high. The three larger trees shown in photos here would not have been affected, as shown by the fact that their bottom branches have all leafed out. If flames had been higher, the buds on these branches would have been killed. Once a tree gets as high as these three, because of their thick corky bark they can usually survive most fires. Small trees and grubs, however, are almost always killed, even by small fires, but then resprout from the base. Grubs can do that over and over, always extending their root systems, until a year may pass when the fire misses them and they get large enough to turn into “legitimate” trees. What will happen to Rettenmund as the years go by. Will parts of it turn into a savanna? Probably only after the three larger bur oaks get old enough to make acorns. How old must a bur oak be before it can flower and make acorns? According to Silvics of North America, bur oaks must be 35 years old before they can make acorns. However, that age is not based on any real research. In fact, at the UW-Madison Lakeshore Preserve bur oaks that were planted in early 2000s have already made acorns.